It offers special protection against withcraft. It prevents poison from killing a person. As a result of so much (mis-)information circling throughout Abuja, dogs are now becoming scarce in the capital city. In fact, many of Abuja’s dog owners complain that their dogs have gone missing, suspicious that they’re winding up in local dishes, like big dog pepper soup pot, which sells for roughly 80¢/plate. Personally, I’d never dream of eating dog, as I would only be able to imagine the face of my own dear, sweet pup staring back at me. Further, I assume most Western travelers would have a reaction much like mine. 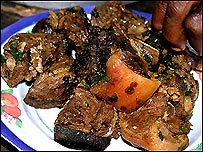 For some Nigerians, however, eating dog meat is a question of culture. According to one man, “I hear they eat frogs in certain parts of the world. But I tell you, no matter how you cook or dress a frog, I can never eat it.” Well…okay. 404: A dog is also called 404 after the French-built Peugeot pick-up van, a tribute to a dog’s ability to run fast. Headlights: A dish with the eyes of a dog as the most prominent component. Gear Box: Dog’s liver, heart and kidneys (usually more expensive than ordinary meat). Tyre: A dog’s legs. Mr Umoh claims that eating a ‘tyre’ makes you a fast runner. Sentencing: The act of clubbing a dog to death rather than slaughtering it. Before you get all up-in-arms about Nigerains dining on dogs, be reminded that Nigeria isn’t the only place in the world where dog is eaten. Would you eat it?